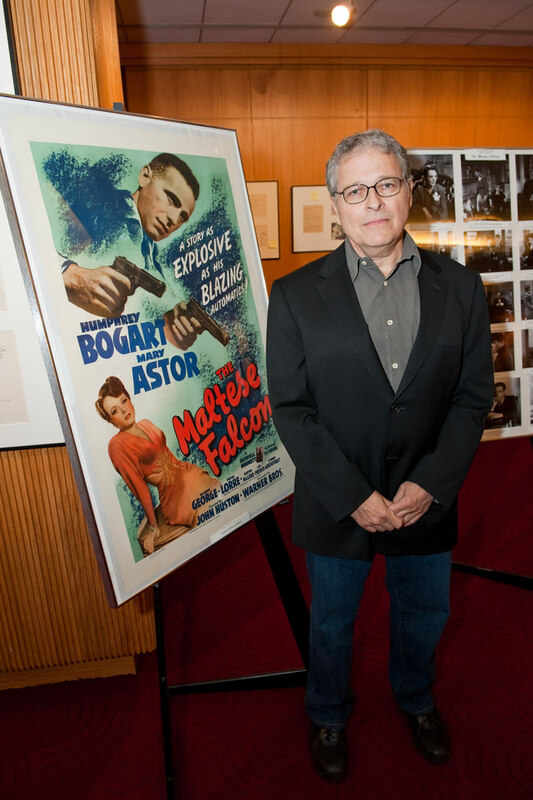 Lawrence Kasdan, whose neo-noir Body Heat starring William Hurt and Kathleen Turner has become a 1980s classic, introduced a screening of John Huston directorial debut, The Maltese Falcon, starring Humphrey Bogart, Mary Astor, and Sydney Greenstreet, at the Academy of Motion Picture Arts and Sciences in Beverly Hills on Monday, May 10, 2010. Shown as part of the Academy's “Oscar Noir,” The Maltese Falcon was one of the first – perhaps the first – “official” film noir to come out of Hollywood. Based on Dashiell Hammett's novel, the 1941 mystery-crime drama also features, Peter Lorre, Gladys George, Barton MacLane, Lee Patrick, and Elisha Cook Jr. Among the film's cast members, only Greenstreet managed an Oscar nomination, in the best supporting actor category. He lost to Donald Crisp in How Green Was My Valley, that year's Best Picture winner. The Academy of Motion Picture Arts and Sciences will explore preliminary research findings and demonstrate how the new technology of “solid state light” (SSL) may transform the color palette of filmmaking in “Illuminating the Future: The Arrival of Solid State Lighting” on Saturday, May 22, at 11 a.m. at the Academy's Linwood Dunn Theater in Hollywood. Hosted by cinematographer Daryn Okada (Leo Tolstoy's Anna Karenina, Mean Girls, Baby Mama), “Illuminating the Future” will include discussions with set decorator Rosemary Brandenburg (Transformers, Public Enemies), cinematographer Caleb Deschanel (The Right Stuff, The Passion of the Christ), make-up artist Robert Ryan (The Polar Express, Beowulf) and costume designer Michael Wilkinson (Terminator Salvation, TRON Legacy). Tickets for “Illuminating the Future: The Arrival of Solid State Lighting” are free, but advance tickets are required. Tickets are available by mail, at the Academy box office (8949 Wilshire Boulevard, Monday through Friday, 9 a.m. to 5 p.m.), or online at www.oscars.org. Doors open one hour prior to the event. All seating is unreserved. The Linwood Dunn Theater is located at the Academy's Pickford Center for Motion Picture Study, 1313 Vine Street in Hollywood. For more information visit www.oscars.org.